Barco wePresent wireless media streaming device Offering the most features for interactive experiences. part wireless system, part media streamer, part perfection Like all wePresent models, WiPG-1600W offers cross-platform compatibility allowing Windows, Mac OS, Android and iOS devices to present and interact together. Barco wePresent WiPG-1600W in uae also offers support for Apple Airplay, allowing users to present using Apple’s native protocol. Barco wepresent WiPG-1600W offers all the features found in the WiPG-1000 plus smart and considerate upgrades. The on-screen annotation and virtual whiteboard features enable presenters to highlight key points and elaborate on ideas during their presentation. Using a USB mouse plugged into the unit, presenters can easily annotate on screen and access conference control features for moderators without a touchscreen display. Insert a USB token into your Barco wePresent to open files, view documents and images, or play audio and video media. 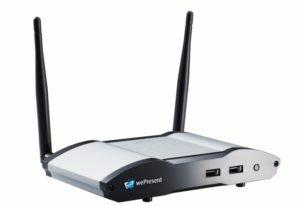 Stream video files to the wePresent wireless media streaming with full 1080p resolution and no latency. On screen annotation for more interactive presentations. Buy Barco Wepresent in Dubai, UAE, Abu Dhabi, Oman, Kuwait, Bahrain, Saudi Arabia, Qatar.